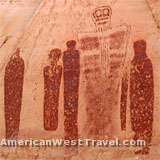 The Utah Indian Artifacts Sites Section of the Canyonlands & Four Corners Travel Guide discusses Ancestral Puebloan - Anasazi - relics found in Canyonlands National Park and the famous rock art found in Horseshoe Canyon, including the Great Gallery. The numerous sites found around Blanding, Utah, and the Trail of the Ancients are detailed, including the fine Edge of the Cedars State Park. Others areas described are Newspaper Rock historic Park, Hovenweep National Monument, and Grand Gulch Primitive Area. Horseshoe Canyon is a detached unit of Canyonlands National Park, northwest of the Maze District. It is known for the proliferation of ancient Indian rock art on the canyon walls. Included is the world-famous Great Gallery, an enormous rock art panel with many life-sized figures. Some consider it the finest rock art panel in the world. The panel was created by the Archaic people who preceded the Ancestral Puebloans (Anasazi, Fremont) in the area, and is thought to be over 2,000 years old. Access to the Horseshoe Canyon trailhead requires driving many miles on a network of dirt roads originating off of Utah-24 near Goblin Valley. Standard 2WD vehicles can get through except during periods of bad weather. There is a primitive campground at the trailhead. The trail drops about 500 feet to the canyon bottom, and will be somewhat strenuous when leaving. Check with the NPS for ranger-guided tours. Visit time: between the driving and hiking, about 2 days. The park protects an enormous Ancestral Pueblo - Anasazi and Fremont people - petroglyph panel near the Needles District of Canyonlands National Park. (Petroglyphs are rock art etched into the wall, while pictographs are composed of paint.) The panel includes a few modern etchings as well. Located on Utah-211, it is an easy stop en route to the Neddles District of Canyonlands National Park. This is an opportunity to see a great rock art panel without hiking or remote driving. The small campground across the road has been closed (per BLM). Visit time: an hour or less en route to the Needles. The town of Blanding has two excellent museums, and there are two ruin sites nearby which are of interest. Edge of the Cedars State Park is canyon country's most outstanding museum covering past and present cultures in the region. Its focus is on the Ancestral Pueblo - Anasazi - civilization. The state park includes a large, partially excavated pueblo. (Photo, left: note how the contemporary museum building blends with the excavated pueblo.) The museum has galleries of ancient artifacts, including a large collection of pots. There is also an ongoing presentation of temporary or visiting exhibits. Highly worthwhile. Visit time: an hour or more. The Dinosaur Museum. A very creative and interesting museum featuring dinosaur skeletons and sculptures, dinosaur tracks, a History Hall of Hollywood Dinosaur Movies, and other featured exhibits. Not related to Indian ruins but still very worthwhile. Visit time: an hour or more. Butler Wash Ruins is located about ten miles west of Blanding on Utah-95. 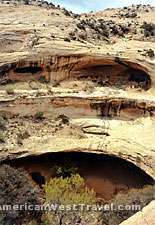 It is a cliff dwelling on a high cliff side (photo, right). To reach the overlook requires a very scenic hike of about a mile over slickrock (photo, left). As you reach the top of a ridge, the Abajo Mountains come into view to the north. Visit time: a couple hours. Mule Canyon Ruins is about ten miles west of Butler Wash on Utah-95, right along the side of the road. It is a small excavated ruin with a parking area. A good place to stop for lunch. Visit time: an hour or less. Grand Gulch is a beautiful sandstone canyon teeming with artifacts from the Ancestral Pueblo - Anasazi - people. Hiking the canyon is an excellent opportunity to view pueblo ruins, ancient rock art, and small artifacts such as pottery shards and corn cobs in a comletely natural and unsupervised setting, and enjoy a scenic canyon at the same time. The entire gulch meanders for 52 miles from Utah-261 near the ranger station before reaching the San Juan River. Few people backpack the entire length. One option is to place a second vehicle at Collins Wash, an exit point about 36 miles downstream. This allows a 3-4 day trip with no backtracking. Another is to enter via Kane Gulch, the main trailhead, hike to the junction with Grand Gulch, then return upstream the way you came. There are some points of interest (Turkey Pen Ruin, Stimper Arch) about a mile downstream from the junction. If you include these, the loop hike would be about 10 miles, a short backpack or a full day hike. The BLM requires permits for both day use and overnight use. The permits are fee-based, and there are daily limits. There are numerous regulations because the area is so fragile. The most important rules are do not vandalize the sites and take nothing but pictures! Leave the artifacts for the next person to enjoy. Contact the BLM field office in Monticello (phone, 435-587-1510) to get a map with points of interest and for complete and current information on permits (policy on reservations or daily limits could change). Grand Gulch is one of canyon country's best opportunities to combine history and scenery. Hiking the canyon is moderately strenuous and requires a little route finding to know where you are. It is an extremely worthwhile trip for those who are able. Hovenweep National Monument protects six groups of highly unusual Ancestral Pueblo - Anasazi - tower-like ruins scattered along the Colorado / Utah border north of Four Corners. The remote and undeveloped nature of the area offers the visitor a unique experience and perhaps a perspective into the ancient world. Many miles from civilization, the monument lies in a vast area of scrubby, open mesas broken by occasional shallow canyons. The look and feel of this place has changed little over the centuries. Contains detailed descriptions of the jeep roads and hiking trails in Utah's largest national park, including instructions on how to find the park's indian ruins, cowboy cabins, and other points of interest. This book is profusely illustrated with 240 color and black & white photographs and 59 detailed trail maps. It also contains a primer on the park's geology. Fully updated and revised, this edition includes trail descriptions and maps of the author's favorite short hikes in the two parks. All hikes included in this little book, with one exception, do not have steep hills, are on well-defined, easy-to-follow trails, and take hikers into some of the most scenic sections of the park.